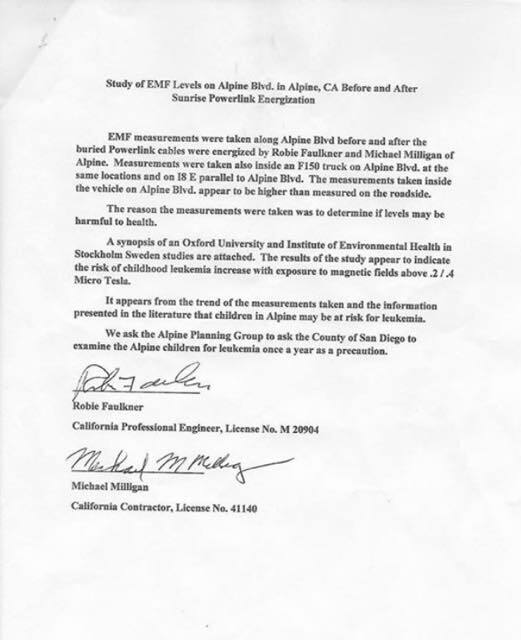 February 18, 2016 (Alpine) – Alpine planners, school officials, and SDG&E have weighed in with responses to publication of meter readings that revealed high electric-magnetic frequency (EMF) levels along Alpine Boulevard, where Sunrise Powerlink high voltage lines are buried. The readings were first published in the Alpine Sun and later highlights, analysis and community reactions were published in East County Magazine and the Alpine Community Network. The study that raised concerns was conducted by engineer Robie Faulkner and contractor Michael Milligan. They found EMF levels were higher at all areas measured than before the Powerlink was built. 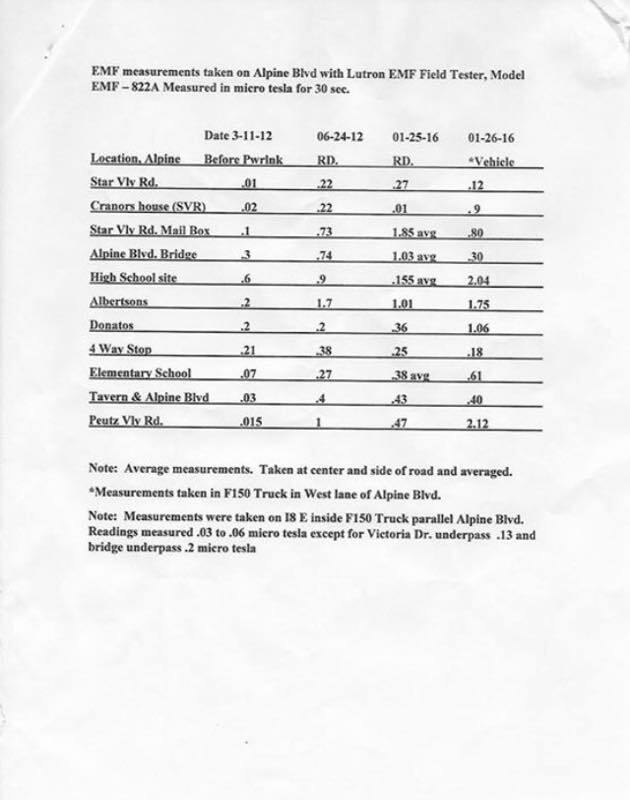 Of particular concern were findings of EMFs measuring .43 microtessla in front of Alpine Elementary School and 2.04 microtessla at the site of the proposed Alpine High School. Some studies have found increased leukemia rates in children regularly exposed to levels of .4 microtessla or higher, though other studies were inconclusive. Study authors Faulkner and Milligan have suggested in a recent letter that Alpine’s children be tested annually for leukemia – a suggestion that has sparked community-wide concerns. The district and the County Board of Education are hiring an independent analyst to survey the rates “to help provide our community assurance in the face of the conflicting reports about EMF levels,” said Cochrane. The Superintendent added that according to the National Institute of Health (NIH), these is a “weak” association between measured fields and childhood leukemia, those it is not clea whether it represents a cause-and-effect relationship. Barnett praised Supervisor Dianne Jacob, who has written a letter to the California Public Utilities Commission calling for a state investigation into the EMF levels in Alpine. SDG&E issued a statement from public affairs manager Don Parent indicating the company is committed to providing “safe, reliable and environmentally sound gas and electric service” while relying on internationally recognized scientific groups such as the World Health Organization and independent regulatory advisory groups that have conducted scientific reviews and health research literature to guide the company regarding EMFs. SDG&E observes that it is “unclear whether SDG&E’s underground transmission line is the only source of these readings” since EMFs can be emitted by household items at levels higher than the values cited.. For instance, “A microwave oven—even from 12 inches away—could create a magnetic field from 40 to 80 milligauss (4 to 8 microtessla) and a hairdryer from 1 to 70 milligauss (0.1 to 7 microtesla). “ Electrical wiring or even plumbing may be sources of EMFs. It’s important to note that magnetic fields weaken the farther that one moves away from the source. So high levels at the street don’t necessarily mean a high risk inside nearby buildings. The Alpine Sun editor has told ECM that measurements inside her office, located along Alpine Blvd., were low and within levels believed safe. According to the National Institute of Environmental Health Sciences, a 230 kilovolt power line might be measured at 57.6 milligauss immediately beneath an overhead line, but just 7.1 milligauss at a distance of 100 feet and 1.8 milligauss at 200 feet away. Sunrise Powerlink is a 500 kilowatt line. An article published in the British Columbia Medical Journal in 2008 for the BC Centre for Disease Control in Canada states that “It has been found that exposure greater than the range of 0.3 to 0.4 microtessla lead to a double risk of leukemia, with very little risk below this level. This exposure range is approximately equal to a distance of 60 meters within a high-voltage power line of 500 kV.” However, underground power lines tend to spike higher directly above the buried line, but drop off more quickly in EMF levels as the distance from the line increases. Sunrise Powerlink is buried in Alpine, but above ground for most of the rest of the route. SDG&E cites the World Health Organization, National Academy of Sciences, Natoinal Radiological Protection Board in England, California Department of Health Services (now California Department of Public Health) and the International Commission on Non-Ionizing Radiation Protection as among entities that have done major reviews and report that the data “does not demonstration that exposure to power-frequency magnetic fields causes cancer or other health risks, although the possibility cannot be dismissed.” More research is recommended and ongoing worldwide. There is no health-based state or federal government standard for long-term EMF exposure. ECM took a look at some of the studies. In the 1990s, most EMF studies focused on very low frequency exposures; some found a “weak” association between EMF field strength and increased risk for childhood cancer, according to the National Institute of Health, which said no evidence of such a link has been found for adults in studies thus far. It is unclear whether all studies accounted for other variables or not. It is also unclear who paid for the studies, or whether any question of impartiality could arise given that utilities including SDG&E have funded some EMF research. A study in 1979 found some children living near power lines had double the risk of leukemia when exposed to .4 microtesslas or more, with some elevated risk at lower levels. Later studies had mixed results, with some finding no link but others showing a risk, according to Cancer.gov. A pooled analysis published in the British Journal of Cancer in 2000 found a two-fold increase in leukemia risk in children with the highest exposure (over .4 microtessla), while another analysis combining data from 15 studies found a similar increase in risk in children with the highest exposure level, Epidemiology reported in 2000. The British Medical Journal in 2005 reported a study in which nearly 30,000 pairs of children in the United Kingdom which could children in homes up to 600 meters from powerlines had an elevated risk of leukemia. An increased risk of 69% for leukemia was found for children living with 200 meters of power lines, while an increased risk of 23% was found for children living within 200 to 600 meters of the lines. The British Columbia Medical Journal in Canada, in a 2008 article, also cited a possible “moderate risk” of brain cancer that “cannot be excluded” at 0.3 or 0.4 microteslla. But the World Health Organization has listed EMFs as merely a "possible" carcinogen. If you’re an Alpine resident, it doesn’t mean your town is unsafe or that it’s time to pack up and move. If you live or work very close to the buried power line and have concerns, you can ask to have measurements taken at your home or business. This is probably a wise idea for pregnant women and families with young children, though the likelihood is that most levels will fall within the EPA threshold of what is considered safe. You may want to avoid repeated strolls directly atop the buried powerline. You can also reduce your EMF exposure to other sources, which can include everything from cell phones to GPS devices to microwave ovens. ECM has asked SDG&E what actions it would consider taking if levels are found above the EPA thresholds in areas where Alpine residents live, work and go to school. We’ve also inquired what shielding methods were used on the Powerlink beneath Alpine Blvd. and whether additional protections should be considered. We will report back when we receive responses to these and other questions.